AdventureCoins allow you to customize your character with rare permanent items including weapons, helms, capes and armors. Permanent means they are usable even when your membership expires. Also, you can use AdventureCoins to add more bag slots - increasing the number of items you can carry! 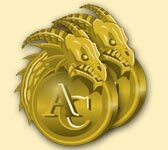 You can also purchase a large amount of AdventureCoins, using real money. You can trade the AdventureCoins in for cool special Weapons or other items. How do I get AdventureCoins? There are multiple AdventureCoins items released that are rare and available for a limited time only. Once these items are gone, they are gone forever, so get your AdventureCoins today! You never know what crazy, awesome, silly, uber-epic items we will released next! Also, look out for special AdventureCoins items included with our releases and live events! Most offers require you to sign up to a website, answer a survey, buy something, or sign up for a trial. Each offer will show you how many AdventureCoins it is worth if you complete it. If you are eligible and you complete the offer, your character will automatically get the AdventureCoins in AQWorlds! Download our BattleBar and earn AdventureCoins when you search! When you login on the tool bar, it will show you your Gold, AC, and clicking the Friends button will instantly bring up a friends list and tell you who is online. The big benefit of this tool bar is the built in Yahoo! Search that will earn you AdventureCoins! Click here to get your BattleBar! Where Can I buy AdventureCoin Items? Your first stop for all your AC-item needs is the AdventureCoin Shop located in Battleon. Head to Valencia, the rare-item hunter, in the middle of town to check out some amazing loot ranging from Sepulchure’s Undead Blade to the Valkyrie Wings of Destiny! Interested in equipping items designed by your fellow players? We have a Player Suggestion Shop dedicated to just that! Head over to Yulgar’s Inn in Battleon and purchase amazing gear such as the Samurai Helmet and the Undead Warrior Armor! Dwarfhold Keep is overrun by powerful dark elves known as Drow. One sure way of surviving the Dwarven depths is to equip yourself with Drow Assassin gear available at Jorxlol’s Shop! You can find Jorxlol in UpperCity, a once prosperous town situated in the middle of Dwarfhold Keep!